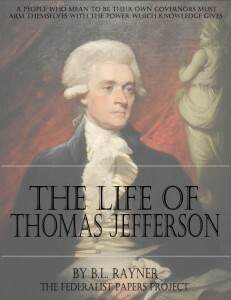 Rayner’s “The Life of Thomas Jefferson” was published just eight years after Jefferson’s death. It is a fervent story, filled with the republican spirit. It was intended to inspire the reader with a full appreciation of the distinguished deeds and writings of one of the great political leaders of this millennium by demonstrating how most of the major facets of America’s new republican society originated in measures proposed by Thomas Jefferson. Rayner filled his biographical account with a large number of selections from the writings of Jefferson based on the then recently published 1829 edition of those writings by Jefferson’s grandson, Thomas Jefferson Randolph. The original edition of Rayner’s Life of Thomas Jefferson was published by Lilly, Wait, Colman, & Holden, of Boston, in 1834.